This is absolutely the cutest little bag you'll ever find. 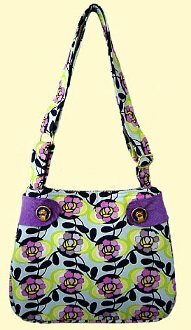 It's quick and easy to construct with two pockets on the back plus two more inside. The little trim pieces that gently pleat the sides really add lots of sparkle to "Sweet and Simple." Try one fabric or make it scrappy - whatever fabrics you choose it's guaranteed to look great!